Where cities are growing and there is an increasing number of people living in a small area, waste is generated. This waste is detrimental to health and the environment. In Bolivia, 20 small towns are confronting this challenge head-on. The result: good services and proud garbage collectors. Not so very long ago, things were very different. Silvia Alejo Oyola used to work as a street sweeper. She would sweep litter off the streets that Villazón residents had carelessly thrown onto the ground. Previously, waste was disposed in an open landfill site located outside of Villazón. This garbage dump smelt unbearable and pigs ate what they found in the muck. Seepage water and wastewater contaminated soils and groundwater. Today Villazón, a city of 50,000 people located on the border with Argentina, is "the municipality with the cleanest waste" and a shining example to the whole of Bolivia. The city has a seep-proof landfill site, a composting plant and a special facility for hospital waste. It has committed citizens who separate their garbage – and who value their waste collector women. Helvetas has helped make this happen. Silvia Alejo Oyola is now a waste collector on garbage lorry number 7 in Villazón. She is a mother and, like most of her colleagues, works "for the children". There is no indication that she feels ashamed of doing a job that is perceived as lowly. On the contrary, she exudes a sense of pride when she talks about her work. Waste and wastewater present a major challenge for authorities all over the world. As the population grows, so do the mountains of waste. Untreated wastewater pollutes rivers and groundwater, thereby creating a health hazard. In the past, when small towns were still a manageable size and environmental awareness was low, the problem was not so pressing. Today, a healthy environment and unspoilt nature are incorporated in the UN Sustainable Development Goals for 2030 – meaning that they should be on every city's agenda. However, no one is willing to get their hands dirty; waste is usually dumped where the poorest people live. While large cities attract investors and service providers – including for waste disposal – small and medium-sized towns are left to deal with issues like this on their own. On behalf of the Swiss Agency for Development and Cooperation, Helvetas is therefore helping 20 small and medium-sized towns in Bolivia to organise their wastewater treatment and waste disposal operations. Given that these small towns are so important for the surrounding rural regions, development cooperation cannot stop at the city limits. As in all partnerships, the work in Bolivia did not begin simply with the construction of facilities. These construction works must be carefully planned by the authorities. That is why the search for solutions takes place at the beginning: how does a city plan a wastewater treatment plant? Where can a landfill site be constructed? What are the necessary services? Who bears the costs? And, very importantly: what do the residents want? What do they need? What contribution can they make? The last questions in particular are key, because without the support of the population, even the best plans would achieve nothing. Here too, Silvia Alejo Oyola's town is exemplary. According to newspaper articles, only a small proportion of the waste now has to be transported to the landfill site in Villazón. Most of it is composted, and the compost is then sold. The rest is separated and recycled. The children of the city have played an important part in making the project a success. Environmental protection has been addressed in every single school, and children have been taught what value which types of waste have and how to sort it and dispose of it correctly. This knowledge has then been taken home and shared with parents and grandparents, aunts and uncles, neighbors and friends. 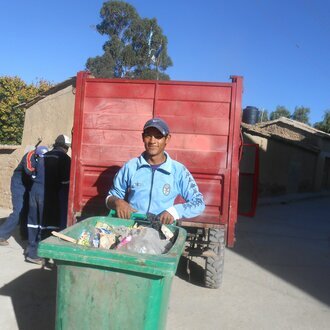 People's lives have also changed in 19 other cities: "There is no paper on the streets any more, we separate waste and dispose of it in the designated bins," explains Beatriz Vallejos Orellana from Arbieto, a small town south of Cochabamba in the country's heartland. Although getting used to separating waste has not been easy, "it's something you have to do". Beatriz Vallejos Orellana no longer packs even her children's sandwiches in plastic bags. Nearby, in Tolata, waste used to be disposed of close to the river. Plastic was swept away, dead animals contaminated the water and poisonous seepage water made its way into the river. Now, with the new landfill site and a repaired wastewater treatment plant, the treated wastewater can be easily used for irrigating fields. All of these facilities and landfills also protect Bolivia's largest artificial lake, the La Angostura reservoir. It is a popular local recreation area and its water supplies large areas of land. The new waste management system, the facilities, the garbage lorries – all this fills the communities with pride. However, they are all struggling to finance these valued new services. 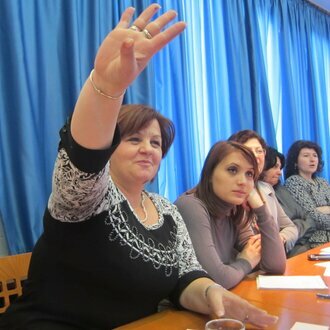 They have benefited from the experience of Albania, where 10 years earlier a Helvetas project faced similar obstacles. In Albania today, 0.5 per cent of family income is collected for waste services. Clearly defined standards are therefore adhered to. Albania's experiences have enabled the Bolivian authorities to make great strides, even if it remains a challenge to convince people of the value of the service. The Albanian delegation was impressed by the commitment of the Bolivian population to separating waste. They have transposed Bolivia's sensitisation and awareness-raising work to their Albanian context in order to motivate people to separate waste. Bolivia's approach to conflict resolution has also been adopted in Albania, for example in seeking solutions to disputes over the location of landfill sites by engaging in talks with all parties concerned. However, challenges remain: it is still the women in the family who are responsible for waste disposal. Men are therefore less willing to separate waste correctly. Silvia Alejo Oyola is one example, however, of how gender barriers can be broken. 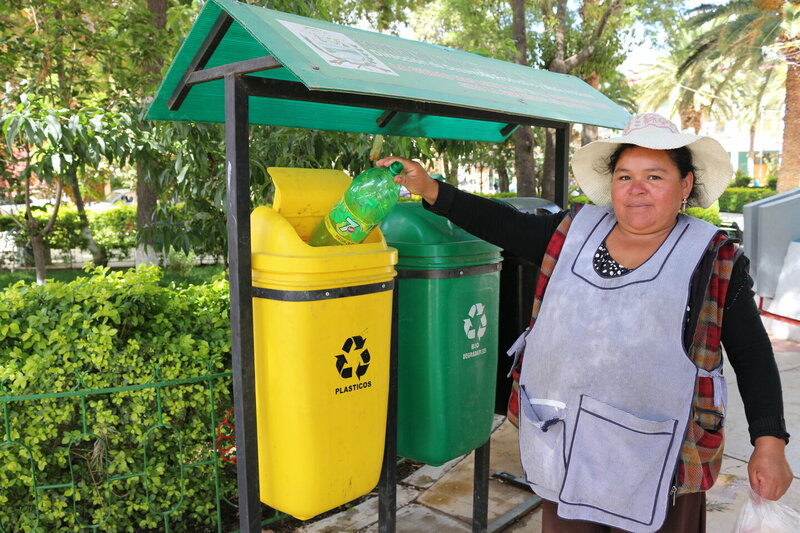 "Villazón is one of the first towns to have waste collector women like me. Men used to do this work," she says. "I've had some very positive experiences at work. It's incredible how much support and appreciation people show us. When people see women collecting the garbage, they come and help us. That's why I can only encourage women. They can do anything they want."